Parents are busier than ever. Most tell me they are too busy to read. 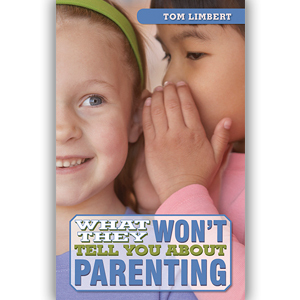 Tom Limbert’s latest book, What They Won’t Tell You About Parenting, is the perfect antidote. This quick read is packed with thoughtful advice that speaks to the heart of the matter. Using references and anecdotes from leaders in a variety of fields, Limbert establishes why it’s important parents recognize they are the ones who set the tone in their homes. He writes, “You can’t let a toddler or a teenager having developmentally appropriate tantrums or mood swings affect your mojo.” Limbert’s straight-talk is hard to deny. I couldn’t agree more when Limbert argues, “What they won’t tell you is that it all starts and ends with you.” Yes, it’s a huge responsibility, but one every parent needs to embrace. As far as Limbert is concerned, “The single most important quality of good leaders is their energy.” Now, I know what you’re going to say, you don’t have any. I get that, I do. I’m no stranger to exhaustion, but as Limbert points out, energy feeds confidence and enthusiasm, both of which are necessary if parents are going to inspire action. Using thoughtful comparisons to inspirational coaches, Limbert demonstrates the importance of attitude, whether it’s trying to figure out how to get your kid to clean up after himself or finish his homework. That’s the kind of tell-it-like-it-is take on parenting you’re going to get in Tom Limbert’s latest book. I found it refreshing. A friend of mine often says she wishes she took some education classes in college because she feels like it would have helped her tremendously as a parent. While 23 years of teaching experience hasn’t given me all the answers by any means, my kids have benefitted from my classroom experiences with boundaries, discipline, and motivation. So I like how Limbert encourages parents to constantly think about how best to teach their child. Limbert believes, “If you are indeed going to teach your child to be healthy and safe and to respect others, you will make your child cry.” While most teachers and therapists know this, it’s hard for many parents to accept. And when kids cry, it’s even more important to be a leader. If your child senses you are spinning out of control, so will she. It’s not going to be easy, but luckily, Limbert’s book offers parents a variety of practical strategies to promote your child’s cooperation. If you think parenting has gotten too complicated, then I recommend you read What They Won’t Tell You About Parenting by Tom Limbert for secrets to simplify your life.